Cerberus the three-headed dog is known as the guardian of the underworld. With its razor sharp teeth, pitch black fur, and piercing red eyes, Cerberus is a foe not to be reckoned with. 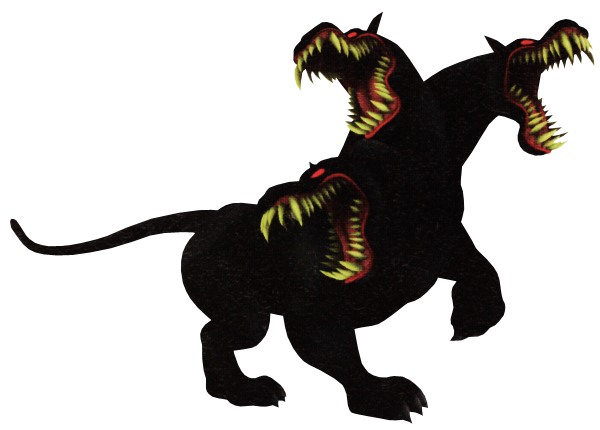 In Kingdom Hearts, Cerberus is Hades' "Plan-B" in the event that Cloud should fail to defeat Hercules, or in this case, Sora. When Hades realizes that Cloud is no longer of any use to him, he unleashes Cerberus once the battle between Sora and Cloud finishes. Cerberus uses his front paw to press an unaware Cloud into the ground, however, when Cerberus goes in for a second blow, Hercules saves Cloud by holding off Cerberus. This also gives Sora, Donald, and Goofy an opportunity to escape. Soon Sora and company realize Hercules is in trouble and go off to defeat Cerberus themselves in order to let Hercules drag off an unconscious Cloud to safety. Cerberus can be faced again at full power during the Hades Cup Tournament. A humongous, three headed dog and the guardian of the Underworld. He obeys Hades's every command, regardless of what it may be. As a result, he fought Sora in the past but was put in his place. Their second fight during Sora's second journey ended in exactly the same way, with Sora's Keyblade and Auron's sword proving to be too much even for three heads to handle.